What is home tutoring/home instruction? A. Home instruction is provided to students when a student is unable to attend regular classes. Q. When can tutoring be provided? A. Tutoring services can only be rendered when school is in session. Sessions may be scheduled during the school day or after school. Q. Where can tutoring take place? 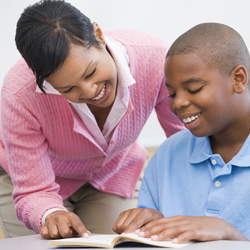 A. Tutoring sessions may be either in the home or the public library of the student's district. Q. Does a parent need to be home if tutoring is scheduled to take place at students home? A. Someone over the age of 18, other than the student, must be home for the entire duration of the session. Q. How do tutors get compensated for the services? A. The tutor fills out a time sheet, which is a log of his/her hours for each student. The parent or guardian who was present during the session will verify the hours by signing the time sheet. Tutors will submit time sheets at the end of the month. Payment will be sent to tutors by Alternative Tutoring. No payment shall be taken from the parents for home instruction. Q. What if my child needs more help after home instruction is over? A. Please contact us if you are interested in continuing tutorial services.